There are inequalities in where people die. These inequalities involve gender, age, deprivation, cause of death, marital status, and locality. Place of death is related to cause of death – 38% of all deaths from cancer were in hospital compared to 63.4% of deaths from respiratory disease. Marital status is the second biggest predictor of place of death. 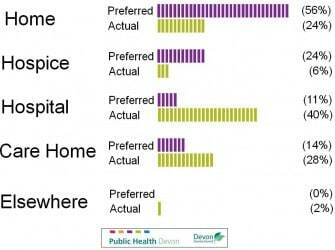 Devon has an older population profile than nationally and the older population in Devon is predicted to grow. 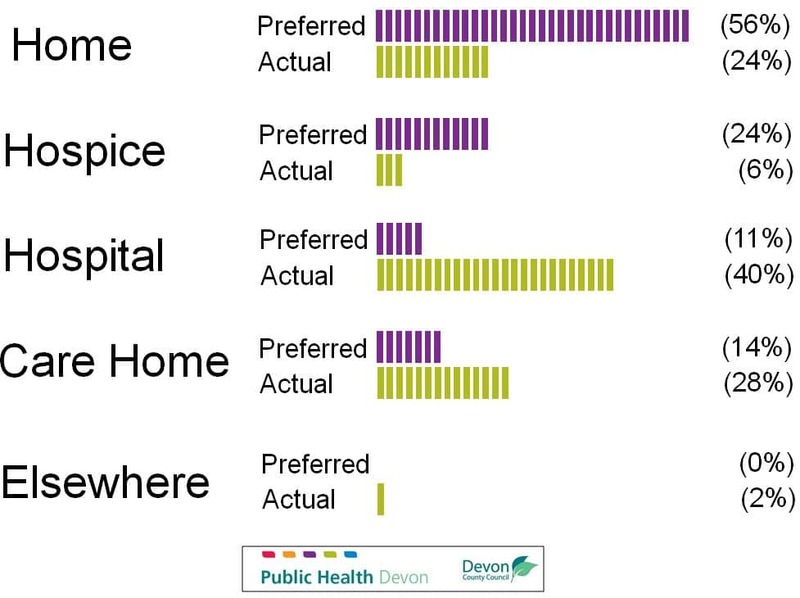 A number of Devon residents have residential and nursing homes as their place of residence and for many, this will be the setting for end of life. Table 10.9 shows the average annual number of all deaths in Devon and deaths from selected prominent causes, plus a crude rate of death per 100,000 population. There are over 8,000 deaths occur per annum in Devon. Due to the older population profile in Devon crude death rates are higher than the South West and England, and are particularly high in Southern areas of the county on account of this. Figure 10.17 shows the increasing trend in deaths at home and in care homes and decrease in deaths in hospital. The proportion of total deaths occurring at home increased from 19.7% in 2008 to 24.0% in 2014. The proportion of total deaths occurring in care homes increased from 23.4% in 2008 to 28.3% in 2014. The proportion of total deaths occurring in hospital decreased from 49.5% in 2008 to 40.1% in 2014. The proportion of deaths in hospice and other settings remained steady across the period. Whilst the proportion of deaths at home has increased in recent years, there is still a gap between people’s preferred place of death and their actual place of death. This is shown in figure 10.18 which shows where people want to be die compared to where they actually die. Table 10.10 and table 10.11 show the estimated number of deaths per annum by religion and ethnic group respectively in Devon between 2011 and 2013.